We will meet and start the outing at 4 p.m. at our Anna Maria Island lodging location. Located between the turquoise Gulf of Mexico and peninsular Florida, the barrier island of Anna Maria is a natural and laid-back paradise. It's a slice of old Florida, how things looked years ago, before the Florida development boom. We’ll enjoy a seven-mile strip of white sand beach, famous Gulf of Mexico sunsets, bird watching, and wildlife viewing. 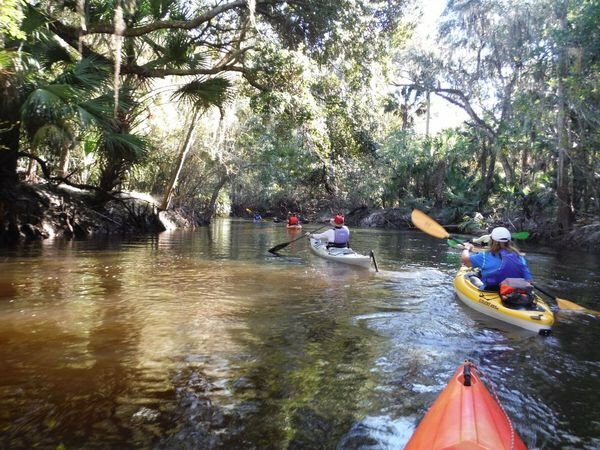 We’ll paddle and explore some of the beautiful and pristine waterways of the area, including Sarasota Bay, Little Sarasota Bay, and the Myakka, Braden, and Hillsborough rivers. We’ll return each evening to a charming and upscale island beach house located across the street from a preserved stretch of beach that beckons visitors to explore it. This itinerary is subject to change due to weather, tides, or other factors. Day 1 — We will meet and start the outing at 4 p.m. at our Anna Maria Island lodging location. We will make introductions, assign rooms, go over the itinerary, and enjoy a huge welcome dinner. Day 2 — After a hearty breakfast, the trip leaders will give paddling and safety instructions and get everyone geared up for an incredible week of kayaking. 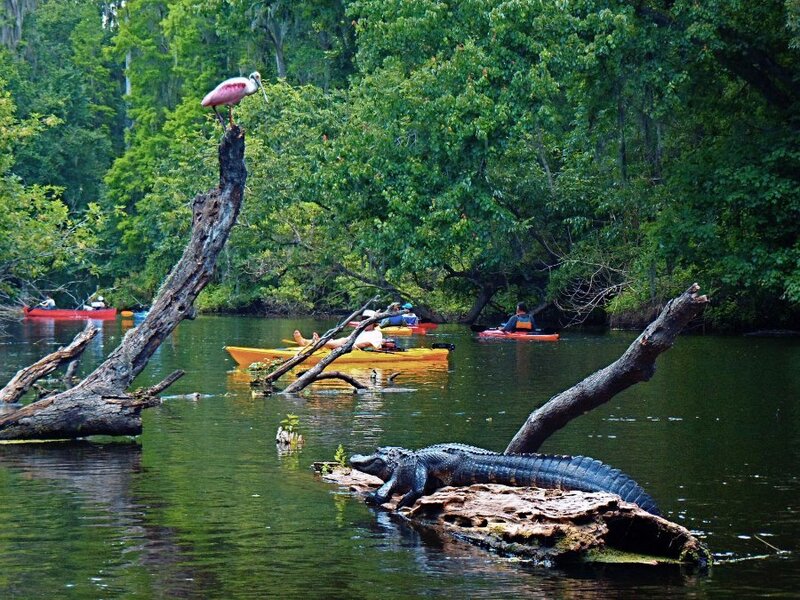 Today we’ll kayak the Hillsborough River. Flowing 54 miles from its headwaters in the Green Swamp to its mouth in Tampa Bay, the river is rich in history dating back thousands of years, as well as amazing scenery and wildlife viewing. As we dip our paddles in and out of the beautiful blackwater, we’ll likely see white ibises drift in the shadows over willow bordered pools as we pass under tall water oaks softly trailed with grey Spanish moss. This is just the start to an amazing week of kayaking and exploring! Day 3 — Today, we’ll paddle either the Little Manatee River or Little Sarasota Bay. The river is designated as an outstanding Florida Waterway and is a kayakers’ paradise, with shady banks and a sandy bottom. Little Sarasota Bay features a marine preserve island and the opportunity to see numerous birds, dolphins, and even manatee. Day 4 — We’ll spend the day with Mote Marine Lab and Aquarium. Mote is an independent marine research institution committed to the belief that the conservation and sustainable use of our oceans begins with research and education. We’ll visit the unique one-of-a-kind aquarium, and also search for dolphins, manatees, osprey, eagles, and other Florida wildlife on an eco-boat tour. Time permitting, we’ll have a short paddle through some beautiful mangrove tunnels. Day 5 — Today, we visit Myakka River State Park. 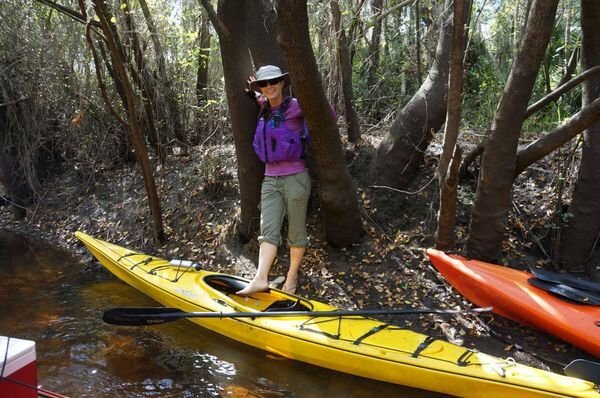 We’ll paddle the Myakka River, which is designated as a Florida Wild and Scenic River, flowing through 58 square miles of wetlands, prairies, hammocks, and pinelands. We’ll also go on a scenic airboat tour of Upper Myakka Lake, searching for alligators and other wildlife. To finish off the day, we’ll take to the treetops with a stroll along a famous canopy walkway. 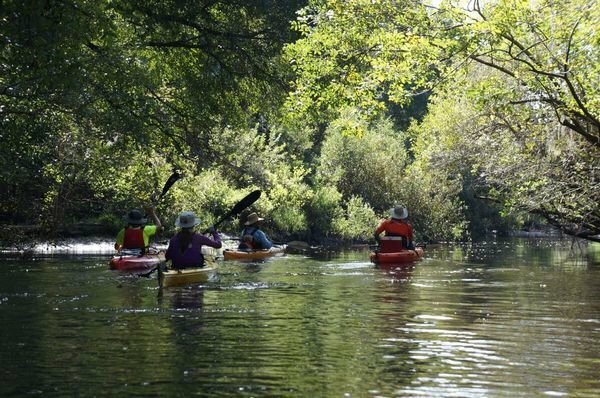 Day 6 — Today, we’ll search for alligators, birds, and wildflowers as we paddle a very scenic and sparsely developed section of the Braden River. Today is a unique experience, as we’ll have lunch at a historic and famously infamous Florida restaurant halfway through the paddle. We’ll get back to the house early enough to enjoy the beach and hopefully see one last famous Gulf of Mexico sunset! Day 7 — After having breakfast and bidding farewell to new friends, this Florida vacation will be officially over by mid-morning. Tampa, Florida offers the nearest major airport and is about a 30-minute drive from our lodging. We encourage carpooling to and from the lodging. We will also carpool to our daily kayak adventures and activities, and we will need volunteer drivers to make this happen. A participant roster and driving directions will be sent to all confirmed participants prior to the outing. Please do not make travel arrangements until the leader has confirmed you as a trip member. We will spend six nights in an upscale island house located across the street from a preserved stretch of beach on Anna Maria Island, Florida. Participants coming alone will share rooms and couples will room together. Participants will take turns helping the leaders prepare meals and clean up. The first meal will be dinner on day one of the outing, and the last meal will be breakfast on day seven of the outing. We will go out to dinner one time and lunch one time during the week; this dinner and lunch are not included in the trip price. Our kayak adventures will feature intermediate routes, averaging 5-10 miles in distance and 3-5 hours on the water each day on this Florida vacation. Walking will be short distances on fairly flat terrain. We will stop to take periodic breaks and eat lunch each day. You need not be an expert kayaker, but it is expected that you have some previous kayaking experience and that you are able to keep up with the group at a reasonable pace. Basic paddling and safety instruction will be given on the first day of the outing. Each participant should understand that this is a group outing and that you will be required to stay with the group while on the water and follow all instructions given by your guides. You should be flexible as plans and itineraries often change due to weather, group ability, tides, water levels, or other unforeseen reasons. We will carpool/caravan to our various destinations throughout the week. You will be asked to share (give or get) a ride with other trip members throughout the week. Note: Please be aware that alligators, snakes, dolphins, manatees, and even sharks are a regular highlight on kayak adventures in Florida waters. They are not interested in kayaks or kayakers, but you should be comfortable paddling among them and other wildlife. We will provide rental kayaks, paddles, and life jackets. You are also welcome to bring your own favorite paddle or life jacket. We will carpool/caravan to our various destinations throughout the week. We will need several vehicles and volunteer drivers to accomplish this. A full gear list will be sent to all confirmed participants prior to the outing. Enjoy lodging across the street from a beautiful stretch of preserved beach. Search for dolphins, manatees, alligators, numerous birds, and other Florida wildlife. 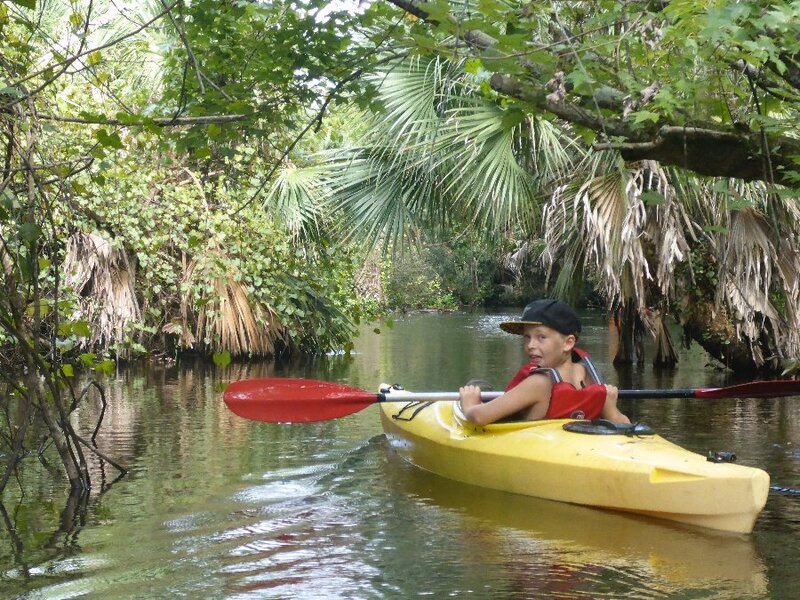 Kayak a variety of waterways, including blackwater, saltwater, and mangrove tunnels. Kayak, paddle, and life jacket rentalLodging and most mealsEco-boat tour with Mote Marine Lab and Aquarium.